Faced with lurking dangers to the budding recovery, Federal Reserve policymakers are sure to leave a key interest rate at a record low to entice Americans to spend more and help the economic turnaround gain traction. The economy started to grow again last quarter for the first time in more than a year, although there are uncertainties about the strength and staying power of the recovery, especially after government supports are removed. 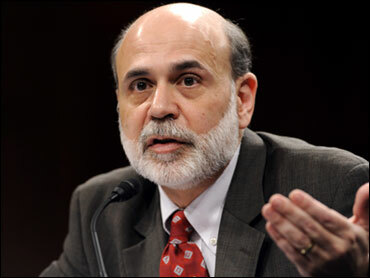 Fed Chairman Ben Bernanke and his colleagues, wrapping up a two-day meeting Wednesday, are likely to note the country's economic and financial improvements. But they'll also warn that rising joblessness and hard-to-get-credit for many people and companies will restrain the rebound in the months ahead. Troubles in the commercial real estate market, where soured loans are contributing to bank failures, also remain a concern. At its last meeting in late September, the Fed opted to stretch out into early next year a key program aimed at forcing down mortgage rates and providing support to the housing market. The central bank isn't expected to veer from that course Wednesday. Wanting to nurture the recovery, the Fed is widely expected to keep the target range for its bank lending rate at zero to 0.25 percent. If it does, commercial banks' prime lending rate, used to peg rates on home equity loans, certain credit cards and other consumer loans, will stay at about 3.25 percent, the lowest in decades. "I don't think there is confidence at this point that the economy is firing on all cylinders by itself," said Bill Cheney, chief economist at John Hancock Financial Services. "It is not ready to be weaned off the extra fiscal and monetary support." Against that backdrop, many economists predict the Fed will maintain a pledge to keep rates "exceptionally low" for an "extended period." The hope is that super-low rates will spur consumers and businesses to spend more, supporting the recovery. The Fed has leeway to do this because inflation has been low, economists said. "The central bankers in the U.S. and Europe are considering the exit strategies," said Sung Won Sohn, economist at California State University's Smith School of Business. "Even the thought of an exit strategy could spook the financial markets and raise the bond and mortgage yields, hurting the economy." Still, there are differences of opinion within the Fed about when it might need to start boosting rates - and how aggressively - to fend off inflation. Inflation hawks, including the presidents of the Fed banks in Dallas, Philadelphia and Richmond, worry more about super-low borrowing costs and other special supports driving prices higher. But waiting too long could touch off inflation. If the recovery takes hold, many analysts think the Fed could start to raise rates in the spring or summer. Bernanke and other Fed officials would try to prepare investors, businesses and ordinary Americans of a shift in stance well in advance of any upcoming shift in stance. One clue would come when the Fed opts to drop its "extended period" language, analysts said. Whenever the Fed starts to boost rates, unemployment likely will still be high, analysts said. The worst recession since the 1930s caused companies to slash jobs and other costs to survive. They won't ramp up hiring until they are confident the recovery is entrenched. The unemployment rate - now at a 26-year high of 9.8 percent - is expected to keep rising, Bernanke and other Fed officials have said. Economists predict it will hit 9.9 percent when the government releases the latest snapshot on employment conditions on Friday. It could rise as high as 10.5 percent around the middle of next year before declining gradually, analysts said. Beyond rates, Fed officials in September were conflicted over whether to expand or cut back a program intended to drive down mortgage rates and prop up the housing market, according to minutes of the closed-door deliberations. They ultimately agreed to slow down the pace of a $1.25 trillion program to buy mortgage securities from Fannie Mae and Freddie Mac, wrapping up the purchases by the end of March instead of at year-end. So far, the Fed has bought $776 billion of mortgage securities. The central bank was not divided over another part of program to buy $200 billion worth of Fannie and Freddie debt. It has bought $141.6 billion so far. The Fed's efforts have helped lower mortgage rates. Rates on 30-year loans averaged 5.03 percent, Freddie Mac reported last week, down from 6.46 percent last year. Meanwhile, the Fed is moving quickly on plans to police banks' pay policies to discourage reckless gambles by executives, traders, loan officers and other employees. The nation's top 28 banks face a Feb. 1 deadline for submitting employee compensation plans to the Fed. The Fed isn't setting compensation, but it will have the power to reject pay plans - and call for changes in them. The Fed also will be encouraging - though not requiring - banks to revise this year's pay plans if they are significantly out of step with principles the Fed has recently proposed to discourage excessive risk taking. Elsewhere, the British government on Tuesday moved to break up two major banks - Royal Bank of Scotland and Lloyds Group - that have been bailed out by taxpayers. At the same time, the government injected more public cash into them.